If the phrases, “Striking Power: 54”, “Strength: 15” and “Fear Factor: 99” have you scratching your head, you probably didn’t grow up playing Top Trumps, the classic card game. Top Trumps sees players do battle with a pack of themed cards (football, monsters, dinosaurs, The Simpsons, etc) as you attempt to win your opponent’s hand. If you beat your opponent's corresponding rating on a topic, you win his card. 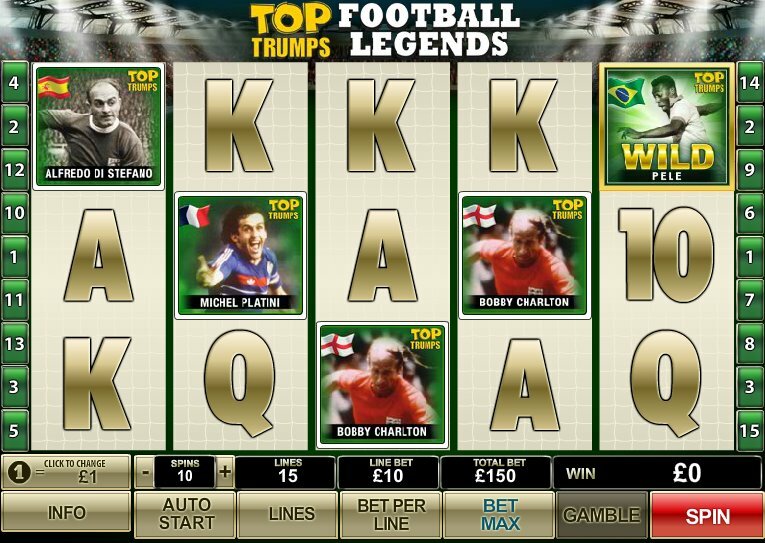 It was perhaps inevitable that Top Trumps was turned into a slots game sooner or later. And where better than one of the game’s most popular packs: football. 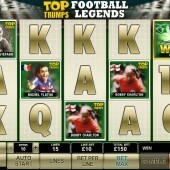 Online slot developer Playtech’s Top Trumps Football Legends is a 5 reel, 15 pay-line video slot, and features 30 different football greats of the past and present, including Pele, Johan Cruyff, George Best, Bobby Charlton, Franz Beckenbauer, Michel Platini, Kenny Dalglish and many more. As well as these greats, the usual 9 through Ace symbols are used to fill out the reels, along with a slew of other great players. More of a Zinedine Zidane fan? He’s here. Can’t get enough of Wayne Rooney and his erratic talents? He’s here too. And, thankfully, the symbols are all represented with photo-realistic pics not cartooned-up versions that you might get in other football-related slots. Fittingly, perhaps, the Brazilian great Pele acts as the Wild. Get five Peles and you’ll bag the top jackpot of 10,000 coins. He’ll also substitute – pardon the pun – for all symbols other than the Scatter symbol. Even better, get five Bobby Charltons and his famous comb-over will do a celebratory animated dance for you. OK, this doesn’t happen, but it would be great if it did. That brings us neatly on to the Top Trumps logo, which acts as the Scatter. Get three, four or five Scatters and you will be awarded 10 free games with extra Wild symbols - a football legend of your choice - added to the game. Your extra Wild symbol will substitute for all symbols in the game except for the Top Trumps Scatter, plus it’ll act as a 4x multiplier. So far, so good, but what else does this game have to trump other slots? Well, when the Wall of Fame symbol appears on Reels 1 and 5, the Bonus Feature will be triggered: cunningly known as the Wall of Fame game. Here is where the card game element kicks in. You’ll see a grid of football legends cards placed face down and you get to pick three of the 16 cards shown. Different cards conceal different cash prizes. Football nuts like me will absolutely love this game, and if you’ve already played Playtech’s other Top Trumps-themed slot, Top Trumps World Football Stars, which allows you to pick two opposing countries before play starts, you’ll know what to expect. Those of you who like to get a bit more involved in your footie action, however, should probably take a look at Playtech’s football-themed arcade slot, Penalty Shootout.